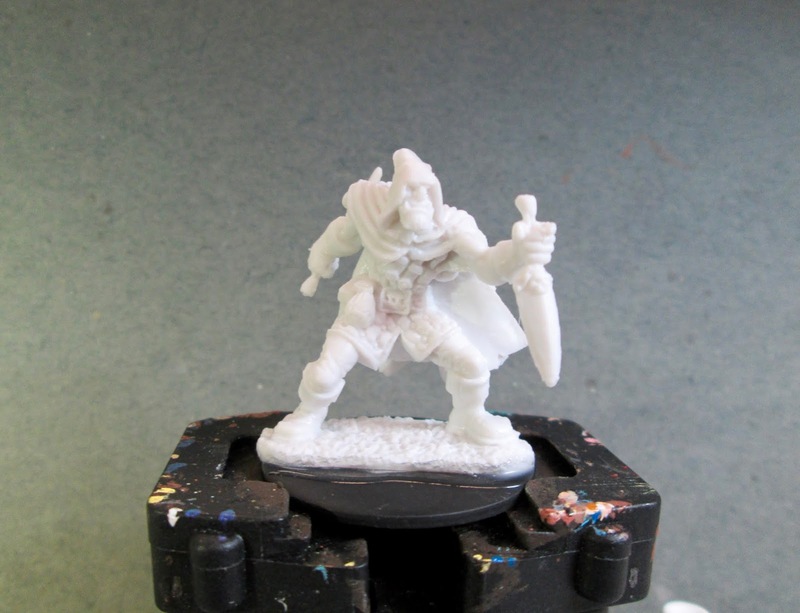 Rogan, Half-Orc Rogue: Bones 2 Figure | H.A.W.K.S. 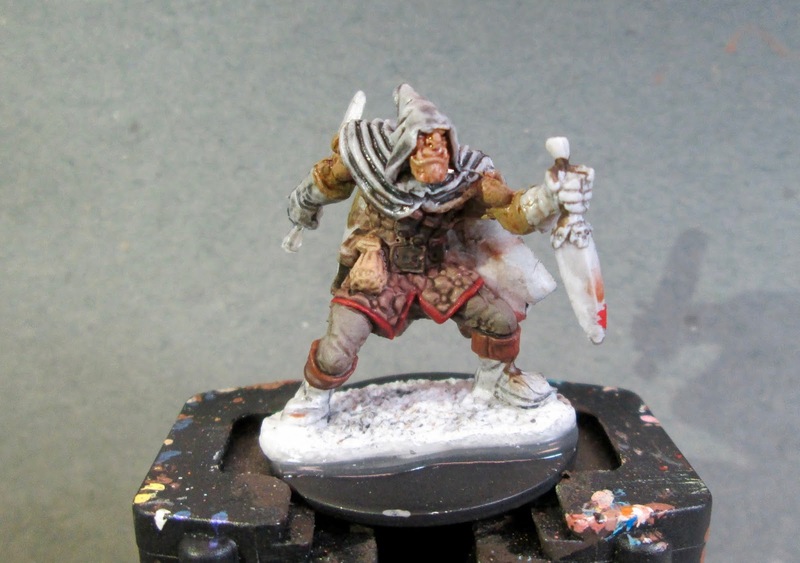 This past week, continuing to try and do simpler figures for limited time reasons, I painted Rogan, Half-Orc Rogue, from the Bones 2 Heroes I set. I began by giving the figure a wash with Reaper MSP “Grey Liner”; and when that was dry, I painted his face and arms with a mix of Americana “Shading Flesh” and Americana “Avocado”. (I believe half-orcs should retain some of the pinkish coloration from their human parent, and not be all green.) I then painted his pants with Americana “Neutral Grey”, and his tunic with Americana “Mississippi Mud”. When the tunic was dry, I gave it a border with Reaper MSP Bones “Cinnamon Red”. Next, I painted his boot tops with Americana “Light Cinnamon”, and the bag tucked in his belt with Americana “Khaki Tan”. I then painted his belt, sheaths, and dagger grips, with Americana “Bittersweet Chocolate”, and his fangs with Americana “Antique White”. 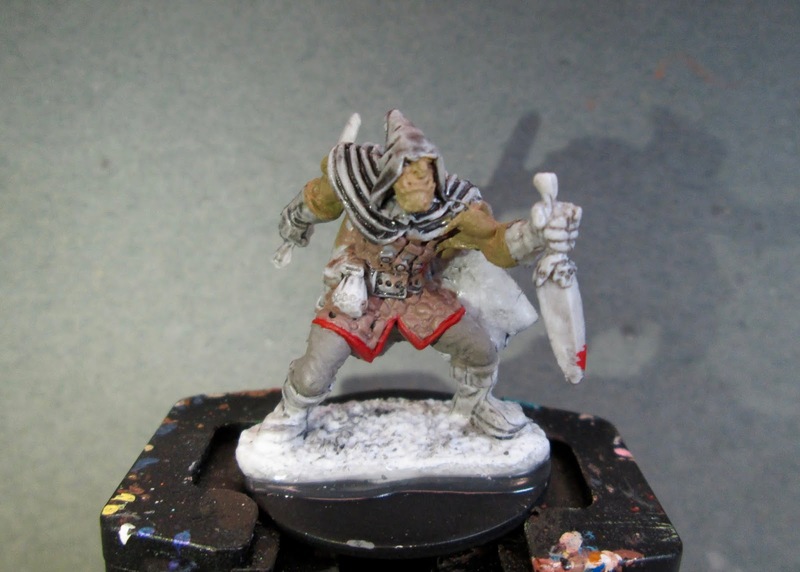 After that, I gave his skin a wash with Citadel “Reikland Fleshshade”. 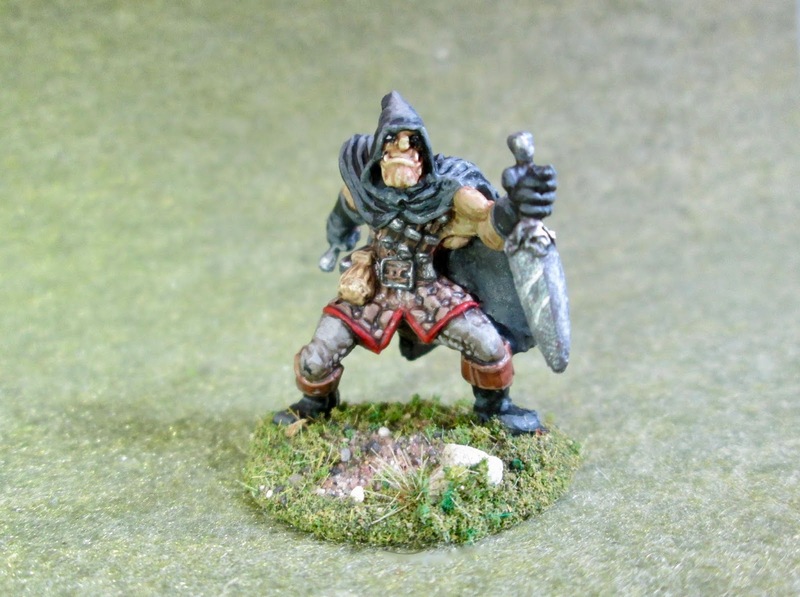 When it was dry, I gave his clothing and accoutrements all a wash with Citadel “Agrax Earthshade” wash. When the washes were dry, I painted his eyes, and highlighted his teeth with CraFter’s Acrylic “Light Antique White”. I then highlighted his skin with a mix of Americana “Reindeer Moss” and Crafter’s Acrylic “Flesh”. Next, I painted his cape, gauntlets, and boots all with Ceramcoat “Black”. 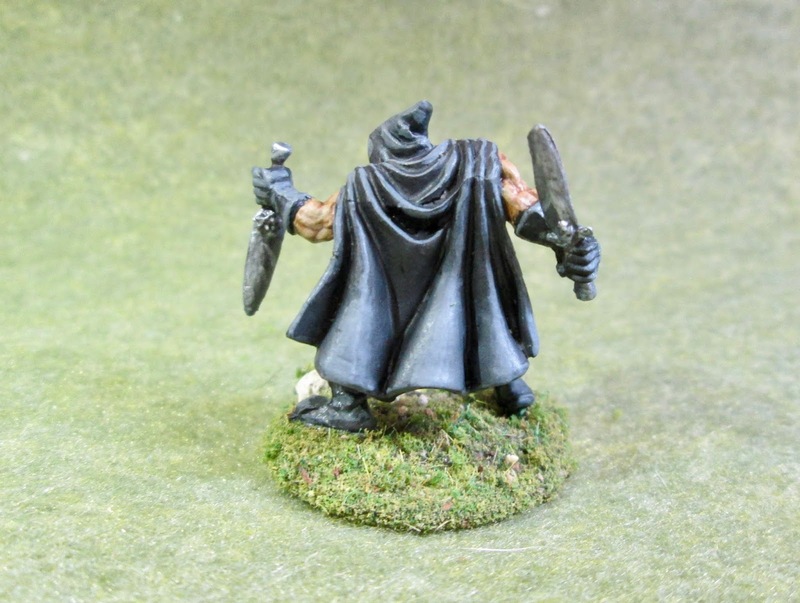 While the cape was drying, I highlighted his pants with Crafter’s Acrylic “Storm Cloud Grey”. Next, I highlighted his tunic with Ceramcoat “Territorial Beige”, and his boot tops with the “Mississippi Mud”. I then highlighted his belt and scabbards with Folk Art “Teddy Bear Brown”, and the bag stuck in his belt with the “Antique White”. After that, I highlighted the cape with Americana “Zinc, and while I had it open, I also used the "Zinc” to base paint the weapons and all the but that were going to be painted as metal. I then went back to the cape and did lighter highlights with some of the “Zinc mixed a bit of the "Storm Cloud Grey”. Next, I went back and went over the weapons and metal bits, including all the little stud in his tunic, with Folk Art Metallics “Gunmetal Grey”, and then highlighted it all with Ceramcoat “Metallic Silver”. I’m happy with how this fellow turned out. I wish his skin had been a little more towards the pinker side of the skin spectrum, but it was hard balance to get just perfect. 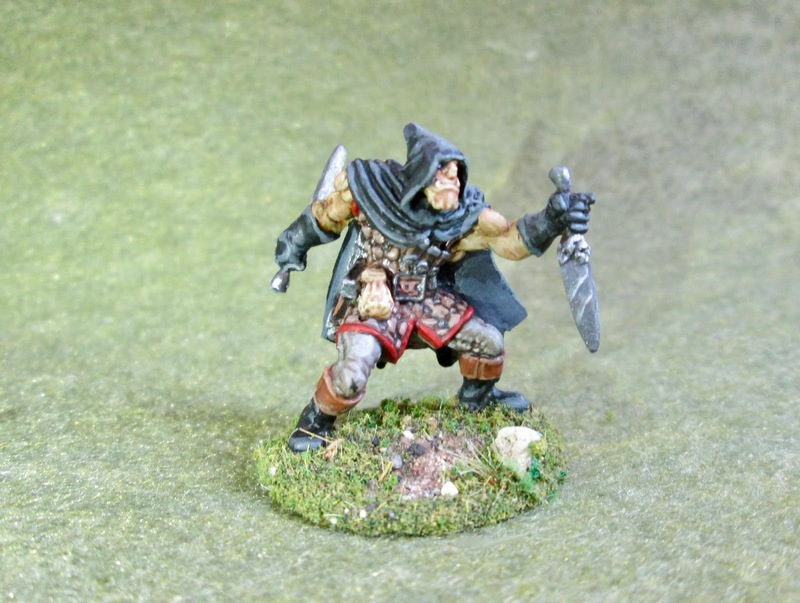 Nice paints, like how that cloak turned out! Thank you, Faust! I’m really trying to be bolder with my highlighting, and I think it’s helping things look better.